U.S. citizen Jason Spindler was among those killed. 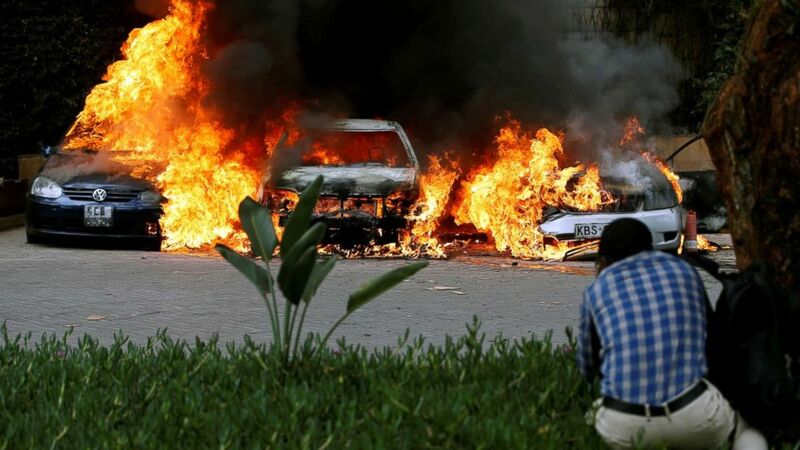 An American was among the 21 people killed when gunfire and explosions erupted at a high-end hotel complex in Nairobi, Kenya, on Tuesday afternoon, according to the U.S. State Department and those who knew him. Kenyan President Uhuru Kenyatta said initially that at least 14 people were killed by "murderous terrorists" in Tuesday's attack. But the country's National Police Service announced on Wednesday that the death toll had climbed, in addition to the five attackers who were gunned down, following the discovery of several more bodies at the scene and the death of a wounded police officer. Sixteen Kenyan nationals, one British citizen, one American and three persons "of African descent yet to be identified" were killed in the attack. Another 28 people who were injured were taken to various hospitals in Nairobi, police said. "We are grieving as a country this morning, and my heart and the heart of every Kenyan goes out to the innocent men and women violated by senseless violence," Keyatta said in a televised address Wednesday morning. (Baz Ratner/Reuters) A glass damaged by bullets is seen at the scene where explosions and gunshots were heard at the Dusit hotel compound, in Nairobi, Kenya, Jan. 15, 2019. Extremist group al-Shabab claimed responsibility for the assault. The al-Qaida-linked group, based in neighboring Somalia, made the claim Tuesday via its radio arm, according to The Associated Press. 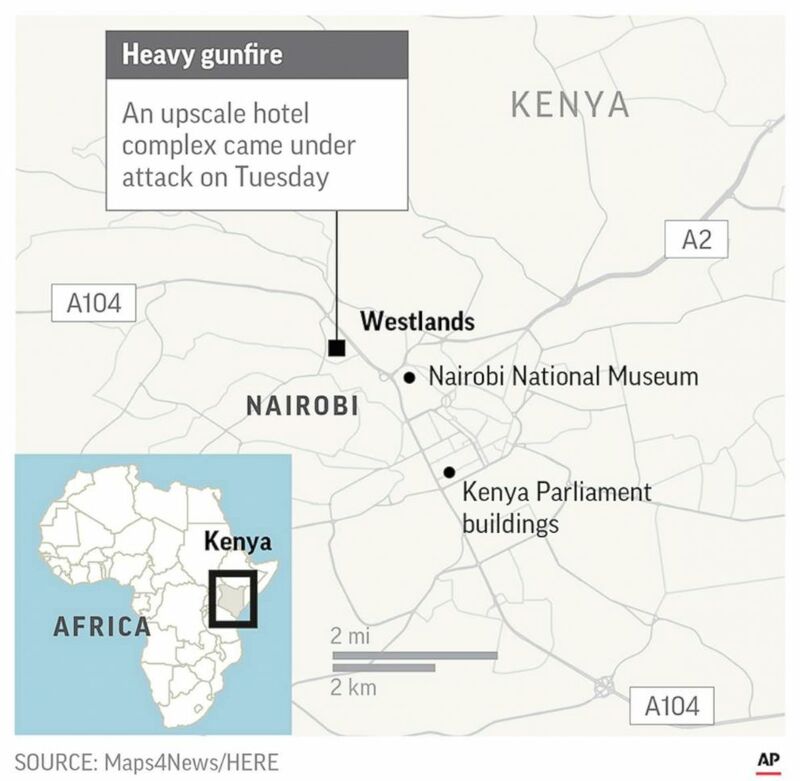 "The attack on the DusitD2 hotel is most likely a response to these airstrikes, judging by the target — an upmarket hotel complex, popular with Westerners, in the heart of Nairobi rather than a Kenyan military base in Somalia," Alexander Sehmer, director of geopolitical intelligence at Falanx Assynt, told ABC News on Wednesday. "It allows al-Shabab to demonstrate their reach and of course has echoes of the Westgate Mall attack from 2013." (Thomas Mukoya/Reuters) Cars are seen on fire at the scene of explosions and gunshots in Nairobi, Kenya, Jan. 15, 2019. 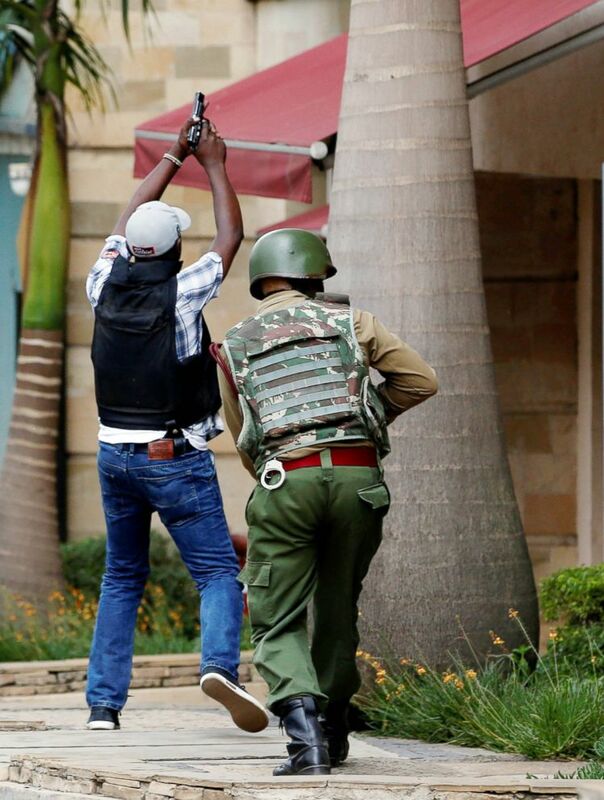 Kenya's Inspector General of Police Joseph Boinnet said Tuesday's attack began around 3 p.m. local time when a "group of armed assailants" stormed the gated complex, which houses a hotel, restaurant, bars and offices. An explosion targeted three vehicles in the parking lot and a suicide bomber detonated inside the hotel foyer, where a number of guests suffered severe injuries, according to Boinnet. (Thomas Mukoya/Reuters) Members of security forces are seen at the scene where explosions and gunshots were heard at the Dusit hotel compound, in Nairobi, Kenya, Jan. 15, 2019. "Specialist forces are now currently flushing them out. 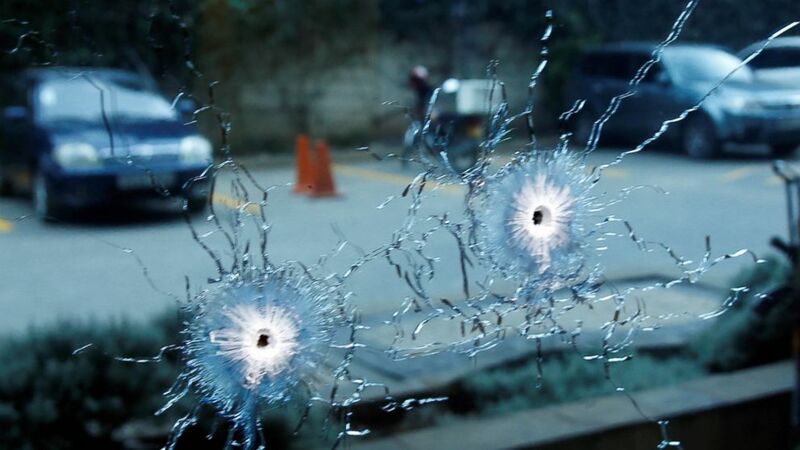 However, we regret to inform that there have been injuries in the attack," the police inspector general said in a press statement Tuesday night.